Jane is a fused glass artist, everything she makes is individually designed and hand crafted by her in her home studio on the Devon/Cornwall border. From a young age she enjoyed painting and creating ‘wonderful’ collages out of felt for her Mum. This interest has continued throughout her adult life and she has always balanced any ‘proper’ job with creative courses such as ceramics, stained glass, rag-rugging, local art groups and an art foundation course in textiles. 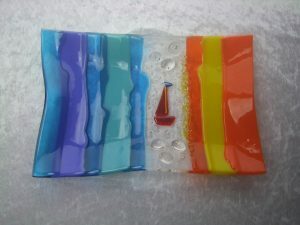 Jane’s interest in fused glass started with one taster course, followed by another. 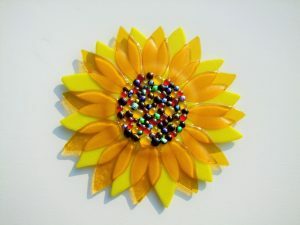 Wanting to learn more, Jane continued with a further year’s educational course in fused glass. Thinking that the college was getting a little worried she was planning on moving in, she decided that the time was right to purchase her own kiln so that she could continue to explore and develop her own ideas and techniques. Much of Jane’s glass is fused at a lower temperature than usual, allowing her to create tactile, textured pieces which catch the light in different ways. Also, her use of vibrant colours in many of the pieces she creates will cheer you up – ‘Happy Colours’, as she likes to call them! As Jane will tell you, ‘Glass in a fascinating medium to work with, and I am constantly in awe of the fact that I can transform the shape and texture of a flat, solid pieces of glass into something more organic and tactile – with some amazing colours and light reflecting qualities. I believe that a beautiful piece of glass can really lift your spirits’. Jane’s inspiration can come from the beautiful scenery here in the West Country, with it’s constantly changing colours and landscapes. Or sometimes the glass itself i s her inspiration. Placing two pieces of glass together on a table can start the seed of an idea using different colour combinations. Or a test pieces may not come out of the kiln quite as envisaged by the result may inspire and interesting alternative. Jane believes that inspiration is there for the taking – it’s translating it that’s the interesting bit! If you would like to meet Jane and see more of her work, please come and visit her on one of her days here in the studio. Or you can get in touch with her via her website. She is happy to talk to you about her glass and welcomes commissions. 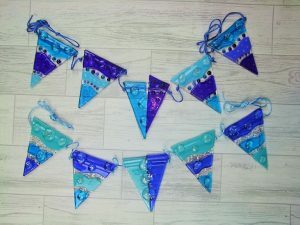 If you wish to explore and idea, match a particular colour scheme or create a unique gift please feel free to contact her either via her email or by contacting her here.